I have had this page up for some time as a general way to help people relate to their orchids in the winter time. But it is clear to me that with the severe weather we have been having in many parts of the globe that I probably need to make some quick remarks. If you have orchids outside anywhere where the temperature will near freezing (32 F., 0 C.) MOST orchids will be seriously damaged if not killed by these kind of temperatures. Most orchids are tropical type plants. In the tropic the temperatures are never near freezing. Some orchids can survive freezing temperatures somewhat (Cymbidiums being a good example). But freezing temperatures over a continued period of time can really damage them as well. If you even "think" your orchids will freeze try to give them some protection. Bring them inside in a hallway, or perhaps in a garage if you can. The structure will give them some protection. If you can not bring them inside, snuggle them up close to the side of a house. Houses can give the plants the extra couple of degrees to help them through the coldest time. Move them into a greehouse if you are lucky enough to have one. Try covering them with a blanket or a cloth and do not forget to remove it the next morning when it warms up. And read the rest of this article to see what general care is helpful in the winter care of orchids. On other pages we have discussed the basic care of orchids. Now we turn to how to care for them during the winter. Where you and your orchids are located will effect how you need to prepare for the winter care of your orchids. Most Southern areas do not need to take special precautions for winter care of orchids except when a frost alert is in place. For the enthusiast, hobbyist or orchid lovers who grow their orchid plants outside during the warmer months this article is for you. We are primarily going to talk about the lighting, watering and temperature changes that will affect your orchids. During the winter season we adults feel the effects of less light and cooler temps giving rise to feeling lethargic or lazy. Orchid plants will also be effected. Orchids need a certain amount of light and temperature to grow normally and the winter season can change that. A significant number of plants will have this as a normal period of dormancy or rest needed to get ready for the next budding period. What about the natural light for the winter care of orchid plants? The days are shorter and the nights longer so plants that need moderate to high light intensity may get short changed. This means that orchid plants like Cattleya, Epidendrum, Dendrobium and Oncidium may possibly need some artificial light. The high intensity orchids need about 12 to 14 hours of light during their growing season and less than that puts them at a disadvantage for generating buds and blooms. It is only in the extreme northern US latitudes that we don't find at least 14 hours of daylight. The intensity of the light may be diminished because the sun is lower in the atmosphere during the winter. So if your plant needs more light you may need to move them from an area of where they used to get bright diffused light to a sunnier area of the home. The use of grow lights is not out of the question either especially for those plants requiring high light intensity like Oncidums and Cattleys. Lighting is an important aspect of winter care of orchid plants and if the plants do not get enough they will not bud. Let's change our attention to watering. The winter care of orchid plants usually means less watering because there is a needed period of rest. Instead of watering twice a week try watering once a week or instead of watering once a week we need to do it every 10 to 14 days. Now this changes if your home has low humidity, in this case you will need to water more often. The normal humidity that orchid plants love is between 40 - 80%. Most homes have about 40 -50 % humidity. If your home does not you may need to use humidity trays. These are metal or plastic trays that are filled with pebbles and then about 1/2 with water. Please check out my page on the humidity trays that I use and LOVE. 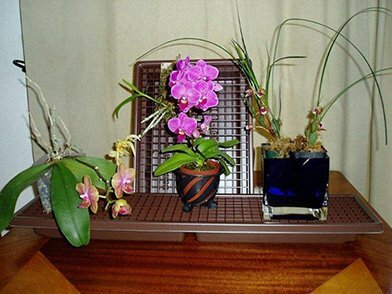 Check out these great Humidity Trays, a wonderful orchid growing tool! The winter care of orchid plants cannot be complete without mention of the required temperature. Since most orchids need temps between 55 - 80 degrees F, the plants in the middle and northern US need to come indoors. There are certain things we need to bear in mind. Normal home temperatures are usually good for orchid plants but we need to consider that if we keep our home temperatures low due to the high heating bills we may need to add some warmth during the day to the plants. It is not good to keep them at a constant 60 -65 degrees, they do need times with temperatures higher. The most common signs of cold injury include injury to the plant leaf which can be seen as pitting marks, large sunken areas or the eventual discoloration which can lead to a brown leaf. The amount of damage varies considerably with the cold injury. If a plant is frozen you will notice this rather fast after thawing. The dead spots on the leaves as well as the flowers and buds is easily noticeable. I hope that you have found "the winter care of orchid plants" helpful. If so please net me know. If there are any other suggestions for topics please let me know by sending your suggestion or comments. "Most" of this article was published in our newsletter for January 2005.